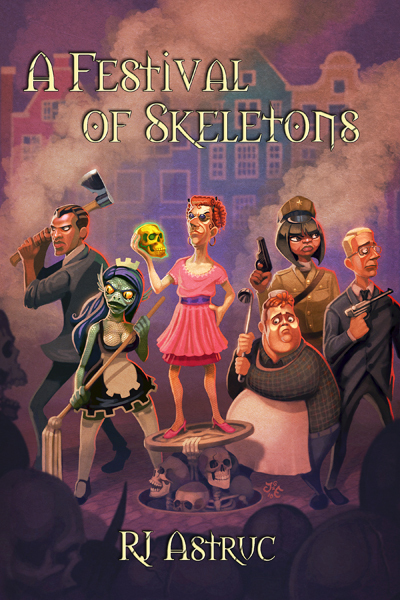 RJ Astruc’s darkly comedic fantasy novel A Festival of Skeletons is being serialized in the Subscriber’s Area of Crossed Genres. On December 1, Crossed Genres will release A Festival of Skeletons in print and various digital formats. Now, as we approach our preorder period for Festival (October), we decided it’s time for a giveaway! Want a FREE Advance Reader’s Copy (ARC) of Festival? Here’s your chance! We’re going to give away two print ARC copies to people who Follow @crossedgenres on Twitter: one to a random person who’s already Following @crossedgenres as of this announcement, and one to a random person who Follows us before Friday, September 17. All you have to do is Follow @crossedgenres, and tweet a link to this post. You can re-tweet this tweet, or create your own – just be sure that your tweet has “@crossedgenres” and the hashtag #FoSARC. That’s it! We’ll randomly select and announce the winners on Saturday, September 18.